Back on the road today – I’ve got about 650kms to get to Calgary, and hoping that it will be a little more interesting and a little less hot than the last long ride 2 days ago. Generally speaking there is more variety to the landscape and it is a bit cooler. I didn’t mention that in Saskatoon it had rained most of the day, but that was fine by me, and I am hoping that the rain will not rear it’s head today. It starts out dry, with broken cloud and the sun is poking his head through. The landscape is still generally flat, but with a bit more interest. Boy, this certainly is the land of big sky’s – the cloud formations are really quite spectacular. I stop to take a couple of pics of the wheat fields. I’m there for a few minutes when Jerry turns up. He is slowing down to make sure I don’t have a problem. It turns out he has been out riding since about 7.30am that morning – about a 150 mile circular route just to set himself up for the day. We chat for a few minutes about the trip and bikes – he hankers after an old Triumph Bonneville or a BSA of some sort: ”Those old British bikes are real cool”. It appears he already has 3 bikes in his garage and drawls “I’ve got space fer another couple in there”. He’s drawing on a cigarette that appears as if he’s probably been sitting on since 7.29am. He looks like a Vietnam Vet, but I guess that’s just the way some Harley riders like to be seen. I don’t recall Canada sending troops over there. Jerry – he’s really just checking to make sure I’m okay. He announces there’s work waiting for him. We shake hands and both head off down the road. I hold back a little – I don’t want to crowd his ride. He’s off to work – I’m off to Calgary and a visit to a cousin I haven’t for about 30 years, so I allow his ride to be more important than mine for the next 20 miles or so. 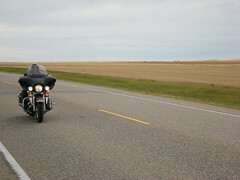 At some town out on the highway I peel off for fuel and a coffee – he notices in his mirror and waves a hand in the air. Nice guy. Ride safe Jerry. The skies continue to fascinate as I head towards Alberta. The ride is fairly uneventful, but I’m still enjoying it and the bike is behaving itself perfectly. This was a good choice of bike. Later on I start close in on Drumheller, which is famous for the amount of fossilised dinosaur skeletons found in the area – more than anywhere else in the world. It also has some fairly unique geological formations. The layers of time are there for all to see. This springs upon you quite unexpectedly – it’s one of those “where did that come from” kind of moments. The general landscape on the approach is more rolling countryside now as well. It’s pretty. On the way out of Drumheller I feel a few spots of rain but nothing much, although ahead of me – and I’m guessing about 20-30 miles – there is a vast dark cloud shaped like a piece of a bridge from a childs wooden train set. The road twists and turns and at one moment I think I’m heading for one of the ‘legs’ of the ‘bridge’ and which appears to be depositing a significant quantity of water onto the invisible souls below, and the next moment I feel I am going to get lucky and sail straight through the bridge where the rain is much lighter. I’m concentrating on this when I see a long shadow on the horizon between the clouds and the Earth. I squint my eyes to try and focus a little better. “No, it can’t be” I tell myself. I’m still 70kms east of Calgary, my cousin and his family. The dark shadow is getting more definition. It is - it’s the Rockies that I can see. They have gently hove into my view and crept up on me like a gentle sunrise appears early on a mid-summers morning. I feel a lump in my throat as I realise just how far I have already travelled across this mammoth of a Country, and that in no time at all I will be riding through them – The Canadian Rockies! This is what I have waited so long for, and suddenly there they are there, beautiful and brooding. I consiously gather my thoughts and get back to concentrating on completing the days ride. I need fuel, and I need to contact my cousin Paul – I still don’t have a clue where he actually lives. I arrive at Paul and Angels house. Angel is his wife. Katelyn is also there. Katelyn is Paul and Angels young daughter and I get an extremely warm welcome from them all – almost as if I’m a long lost relative ….. Oh, I am! We sit, eat, chat. Paul gets out some old family photo’s. It’s a nice evening, but over all too soon – Paul has to be away to the office by 5.30am (I used to do stupid things like that too) and before retiring to bed we have to shake hands and promise to not leave it another 30 years.